This system can record in mono, stereo, or any current or future surround format — using just one mic! 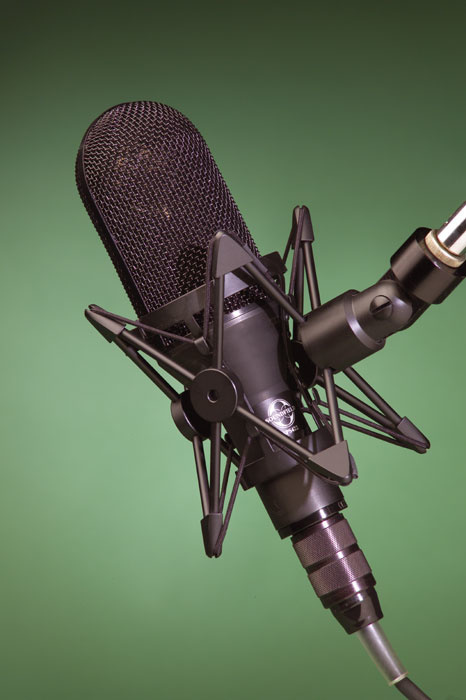 The Soundfield microphone has, in the quarter century since its inception, acquired a reputation as one of the finest and most versatile microphones in the world. Although many well-known recording engineers seem content to use it as a top-flight mono vocal microphone — ignoring its stereo and multi-channel capabilities completely — it is as a multi-channel device that the Soundfield microphone stands head and shoulders above pretty much any other system. The SP442B microphone system includes this multi-capsule microphone. The rack unit accepts the mic's output and converts it to stereo and B‑format signals.Photo: Mark EwingThe subject of this review is a surround sound recording system comprising the SPS422B and SP451. The package is realistically priced in the UK, and provides a very versatile and easy-to-use system for the acquisition of surround sound, with the bonus of being track-efficient and both backwards and forwards compatible — recordings made in Soundfield's B‑format can be used as the source for mono, stereo, LCRS, 5.1, 6.1, 7.1, 10.2, or any other format you care to dream up! The SPS422B comprises a Soundfield multi-capsule microphone and its 1U rackmounting controller — the mic and controller are matched to one another during manufacture, so you can't swap mics and controllers. The microphone connects to the rear panel of the controller, and the balanced line-level outputs are presented on six XLRs: a main stereo output plus the four B‑format signals. The front panel is laid out clearly, with just five rotary controls, four buttons, and a large dual bar-graph meter. To the left of the meter, two sets of control functions affect the B‑format signal. A rotary switch and continuous rotary control determine coarse gain (switched in 10dB steps from zero to -30dB) and fine gain (over a ±10dB range), while two illuminated buttons configure the unit for the particular microphone orientation in use (inverted and end-fire modes). To the right of the meter, the controls adjust the stereo output. It is worth remembering that the unit actually works internally with M&S signals, so the two rotary controls to the right of the meter adjust the nominal polar pattern of the Middle channel, and the level of the Sides channel. Together these controls effectively determine the mutual angle and polar patterns of the equivalent stereo pair. The output can be left in M&S mode, or converted to normal left-right stereo, via a button — the current mode is indicated on the bar-graph meters' legends. A second button selects an 80Hz high-pass filter. The final rotary control is a headphone monitor level control adjacent to the stereo headphone socket. The bar-graph meters have a VU ballistic and are scaled from -30dBu to +21dBu. The action of the Pattern and Width controls can be confusing to those not versed in M&S theory, but help is at hand in the form of a small program which can be downloaded from the Soundfield web site. This provides an interactive graphical illustration of the effects of these controls, both on the source M&S virtual setup, and on the equivalent left-right microphones. After ten minutes of playing, the system becomes blindingly obvious! The SP451 has a very simple set of interconnections: four XLRs for the balanced line-level B‑format inputs, and eight XLRs for the line-level transcoded surround-sound outputs. The review unit was set up to provide a 5.1 surround-sound output, so the last two XLRs are unused. However, with an appropriate decoder card (see below) they can be used to provide outputs for a 6.1 or 7.1 system. Like that of the SPS422B, the front of the SP451 is very clear and simple. Starting at the left, a master input level control adjusts all four B‑format signals simultaneously (from full attenuation to 10dB gain), and the result is shown on four bar-graph meters. To the right of these meters, three rotary controls adjust various aspects of the transcoding. The system uses the B‑format input information to create six virtual coincident microphones — all with cardioid polar patterns by default — to feed the 5.1 surround outputs. The first knob is labelled Front Width and alters the effective mutual angle of the microphones which feed the left and right front loudspeakers. The range is from zero degrees (mono) through to ±90 degrees (relative to the centre), with a Cal position equating to ±45 degrees. The second control, Rear Width, does exactly the same for the rear left and right microphones, with the default position equating to angles of ±135 degrees. The third control is labelled Rear Focus and alters the effective polar patterns of the two rear microphones. The default is cardioid, but the range spans omni to figure of eight. Together, these three controls provide a remarkable degree of control over the nature of the surround sound stage by determining the frontal width, the rear width, and the ambience. The Rear Focus control is very useful to 'blur' the rearward definition by choosing a pattern which captures more spatial information, for example. The right-hand section of the front panel is concerned with the output signals. Six rotary controls, each with an associated bar-graph meter, are provided to adjust the output level (from fully off to +10dB) of each of the first six surround outputs. An alphanumeric display above each meter identifies each channel, depending on the currently selected transcoding mode. In the review model the controls were labelled Front Left, Centre, Front Right, Rear Left, Rear Right, and Sub-bass. The transcoding mode is determined by one of up to three plug-in MAP (Microphone Array Pattern) cards. The card supplied with the unit transcodes the B‑format signals to five coincident cardioids plus an omni for sub-bass output below 120Hz. However, other formats are available to order, including options to generate 6.1 or 7.1. Three illuminated buttons are provided to select one of the three possible MAP cards, enabling instant comparison between different transcoding configurations, but since the review model only had the single card I was able to try this particular facility. Since I have owned my own SPS422B Soundfield microphone system for a couple of years now, the basic operation of the microphone was already familiar to me. It is worth mentioning that for the novice there is a bit of a learning curve involved in getting to grips with the width and pattern controls, since these are not entirely intuitive. However, they are the key to controlling the stereo sound stage output from the SPS422B itself — although they play no part whatever in the context of the subsequent surround-sound transcoding from the B‑format outputs. The other practical consideration concerns the meters. As standard, these have a kind of VU response which can under-read considerably on fast transients. A rather percussive piano recording, which was peaking around +1dB on the meters, was actually causing transient overloads of the front end of the unit, so care should be taken with this aspect of setting the input level. The B‑format signals can be recorded directly to a four-track machine for subsequent processing and decoding to whatever format is required. Clearly, the four B‑format signals have critical phase relationships which must be maintained, but this should not present problems with modern multi-channel digital recorders. In addition, if a further two tracks are available, then the stereo outputs from the SPS422B can also be recorded — perhaps providing a stereo track for editing and a B‑format surround track for subsequent post-production. Needless to say, because the stereo (and surround) outputs are derived from a point-source microphone, the signals can be folded down without risk of phase errors: stereo to mono, and surround to LCRS, stereo, or mono. I recorded and replayed the B‑format signals successfully using both SADiE and a Genex recorder, and hooking either up to the SPS422B and SP451 presented no problems at all. I used the SP451 as a kind of preamp, the B‑format input coming from the recorder and the six outputs directly feeding the Bryston amplifiers of a surround-sound system comprising a collection of PMC speakers (IB1s left and right, LB1 centre and TB1s at the rear). This arrangement worked well thanks to the full attenuation capability of the input gain control of the processor, but in more normal usage the processor would probably be feeding a post-production console. With the default conditions I found the transcoding worked superbly, recreating a very precise and all-enveloping sound stage. However, adjusting the SP451's controls enabled a wide range of different sound stage characters to be created, from accurate and naturalistic to diffuse and ambient. It was also possible to create some dramatic effects — simulating walking through a long corridor and out onto a stage, for example — by starting with front and rear widths set to zero, and then winding them up to exit the corridor. The combination of SPS422B and SP451 is a very powerful tool for the capture and reproduction of surround sound, and is ideal for anyone involved in the recording of music or radio drama, for example, or indeed for the acquisition of atmospheres and sound effects, easily accommodating all present and future formats in a simple and compact form. Not only is the imaging extremely precise (if required), in much the same way as that of a conventional coincident stereo pair, but the surround stage can be recorded on just four tracks (instead of six or more), and can be easily converted for any surround sound format, including formats involving a height element. Furthermore, although the facility is not present with this specific equipment, it is possible to post-produce B‑format recordings to control the orientation and azimuth of the virtual microphone array, which could prove very useful in some circumstances. As with coincident stereo systems, additional sound elements can be mixed in with the decoded B‑format signals to create a fully mono- and stereo-compatible mix — something which is often not the case when using surround atmospheres captured with spaced microphone arrays. Although there's only one mic to set up, you can instantly audition a variety of different coincident multi-miking configurations. The B-format signal can be converted into any current or future surround format, and can be recorded using only four tracks. Versatile transcoding of B-format signals using the SP451. The operation of the front-panel controls can take some working out when you're using the unit for the first time. A versatile recording package which will record anything from mono to 7.1 surround. The B-format outputs provide future-proofing for your surround recordings. SPS422B £3143.13; SP451 £2320.63. Prices include VAT. Drawmer Distribution +44 (0)1924 378669.